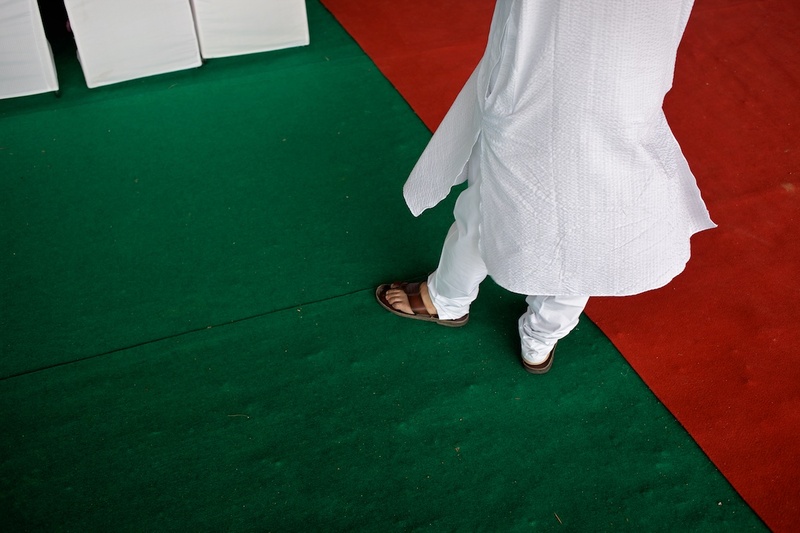 This photograph was taken at the opening of a new university just outside Delhi last weekend. Beyond the red carpet, there were thankfully few other symbols to denote distinction among the guests. But it doesn’t take a great deal of searching to find loud pronouncements of status and social standing all over India. From the prominently posted list of VVIPs who are exempt from security at the airport to my landlord’s enthusiastic and often superfluous planting of a purple rubber-stamp beneath all of his correspondence (“Dr. V.N. Khosla, B.Sc., M.B.B.S., D.P.H, M.D.”), displays of status in India represent more than an expression of power. Flaunting your stature provides very real benefits by smoothing out bureaucratic hurdles and exempting you from the scrutiny of others. One of my neighbours is an elected member of the Haryana State Assembly. At the last count he had four cars, three of them hulking SUVs which by their very size are a statement of his political brawn. Along with a little flag-pole and two tannoys, one of the cars happens to be fitted with tinted windows. Apparently this mark of authority is not enough on its own but must be supplemented by a large and conspicuous sticker authorising use of the tinted glass. The subtext here is surely to dispel any lingering doubt as to the superiority of the vehicle’s occupant. Last year I was provided a small taste of the kind of practical, day-to-day benefits afforded those who rank higher in Indian society than I do. Benefits that I’m sure my powerful neighbour has long-taken for granted. It was while on a photographic assignment for UNDP in Maharashtra in western India that I employed a local taxi hire who’s normal duty was to ferry the District Collector around on official functions. As a consequence our car was fitted with a flashing amber light stored beneath the glove compartment. We had no excuse to use this beacon of authority on our road-trip but when approaching the many toll booths that lined our journey, it was without hesitation or doubt that the driver reached over towards my feet. Lifting the glowing light up from the floor, he plonked it on top of the dashboard. Combined with a gentle squeeze to the accelerator and a complementary blast of the horn, the effect was immediate and indisputable. The uniformed toll-guards – normally such harbingers of frustration – were transformed into an obsequious blur. Retreating into their booths, none was willing to put their job on the line simply to verify the legitimacy of our privilege. I wish I could get my hands on such a powerful light to get around New York, Tom! I’ll have a word with my taxi-driver friend and see if we can sort something out for you! Got here via the Politics, Theory and Photography blog – and am really glad to have! Really enjoyed going through your previous posts and the photographs. I love this one – with it’s contrasting red and green and neutral white. Lovely!